I think that it’s cool that they used towels to collect the water. That’s exactly what I would have used down here on earth, and basically means that I have space age equipment in my bathroom. Amazing. Relations between the US and Russia aren’t all that great on earth at the moment, and there are issues 420km up as well: remember the hole in the ISS window? Well, as was pointed out in the comments on that post, there’s a suspicion that it might have been sabotage, and Russia aren’t happy about it. But Rusky or Yank: if your toilet leaks in a confined space all that way up, you know urine trouble. A genuine case of “Houston, wee have a problem”. It must be driving them potty, but I’m sure they’ll soon get to the bottom of it. I wonder what Vladimir Poo-tin will have to say about all this? With apologies to Tim Finn and Split Enz for borrowing stealing their title. The ISS (you may remember it from posts infinatum on here) has sprung a leak. Look. We all have problems and they affect us all in different ways. There are levels here. My laptop may have just taken a hit of Nespresso to its power switch, but all the oxygen that I rely on for breathing isn’t disappearing into space. Apparently, the leak was likely caused by a MicroMeteoroid and Orbital Debris (MMOD) strike to one of the windows. A MicroMeteoroid is exactly what it sounds like: a very, very small meteoroid, but it was the Orbital Debris bit that got me interested. Orbital Debris is also exactly what it sounds like. Debris in orbit around Earth. But what I didn’t realise was that it is often man-made. Yep. We’ve dumped shedloads 0f litter in space too. Great. Is there actually anywhere that we have f**ked up yet? Although spacecraft are designed with a level of protection from such impacts, MMOD was the third biggest threat to losing an orbiter during her mission – second only to launch and re-entry. During the Space Shuttle era, all of the orbiters would receive flesh wounds from MMOD strikes. Atlantis and Endeavour both suffered “bullet hole” impacts to their radiators, with Atlantis’ damage was sustained when she was hit by a tiny piece of circuit board on orbit – likely from a destroyed satellite. The damage held no mission impact and was only noticed once she had returned home and was in post flight processing inside her Orbiter Processing Facility (OPF). Of course, NASA did a whole risk-analysis, debriefing, scientific investigation technical report paper on the whole thing. During the investigation, they tried to recreate the incident (in a lab on earth) by firing a bit of circuit board at a space shuttle panel at 4.14km/sec (that’s about 15,000kph). 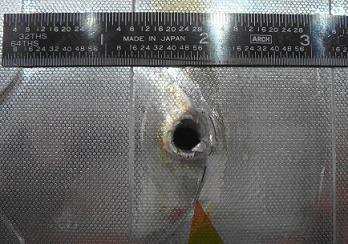 The entry hole on the original space shuttle panel was 2.74mm in size. The fragment of circuit board was only 0.4mm long, but when it’s going that fast, even little stuff is going to hurt. There’s no evidence that the ISS window strike was from a man-made object, but it’s a proven fact that we’re literally putting astronauts in danger by putting them in the firing line of plastic rubbish that we’ve put into space and which is now hitting the ISS and other spacecraft. Click through here for full size. False Bay all across the middle. Rooi Els and Pringle Bay top left. You may also be able to pick out Steenbras Dam, just above Gordon’s Bay down in the bottom left corner of False Bay. Hint: Look for the light coloured sand, rather than the blue coloured water. Hmm. 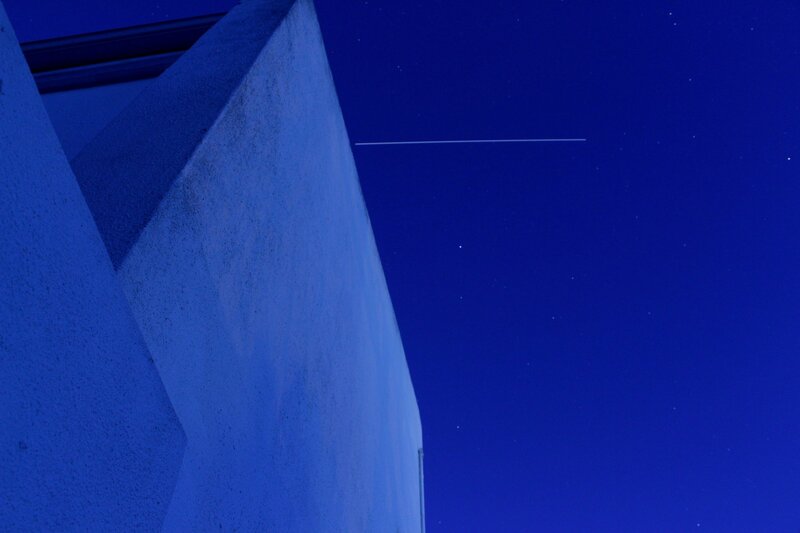 I grabbed my trusty camera at the last minute and shot the space station as it passed over Cape Town yesterday evening. Quickly adjusting the exposure time and f-stop on the manual exposure setting allowed me to capture this quick and dirty shot of it going over, but it was only upon reviewing the images later that I realised that a little tweaking of the white balance (which had been set to “Tungsten” for this image) may have been advisable. It wasn’t a Blue Sunday really. And – aside from the sky – today isn’t really a Blue Monday either. My ISS Detector app has detected that the ISS will be passing over tonight. 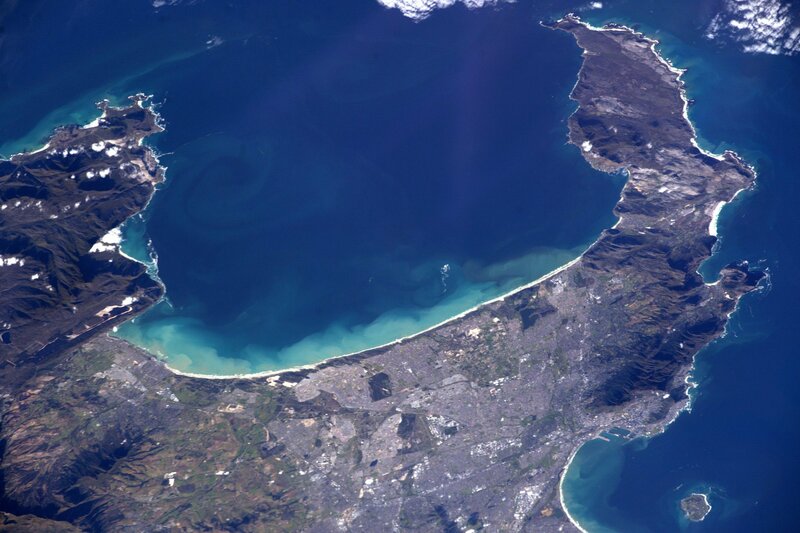 Over Cape Town, that is. It’ll be passing over a lot of the rest of the world as well of course, but it’s the Cape Town bit that I’m going to be looking out for. Here’s a quick screenshot from my phone, showing a few details. As you will note, the pass begins near Uranus just before… I’m sorry? Is there something you find amusing about that? Honestly, grow up. Anyway, you’ll need to look North West towards Uranus at… STOP SNIGGERING AT THE BACK! You’ll need to look North West at 7:58 this evening, and you should see a bright white dot racing South East across the sky. You won’t need a telescope, binoculars or a magnifying glass. You won’t miss it: it’ll be the brightest object up there. And the only one that’s moving at 8km/second. Take your kids out and show them before bedtime, and let’s hold thumbs for a cloudless evening. 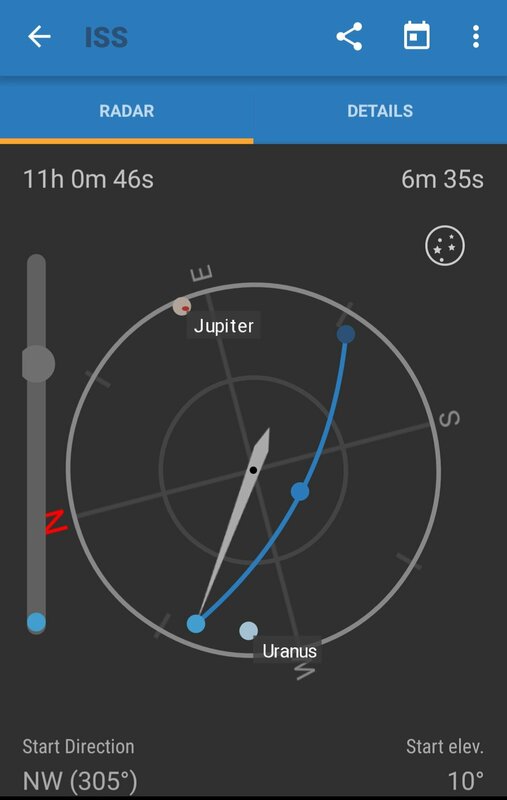 For the nerds out there, I use RunaR’s ISS Detector app (actually, I have the Pro version at R29, but the free version does most everything you need), and it’s really good for alerting you to interesting stuff in the sky.